A mother in Melbourne has been causing a bit of stir recently, with her petition to the Education department and her local school to allow her daughter to wear trousers (pants) to school rather than the mandated school uniform dress. A media storm has been whipped up, and she has been accused of undermining the authority of schools, and while many people have spoken up in support (not least the 17,000+ supporters of the petition to date), a lot of mud is being slung around. 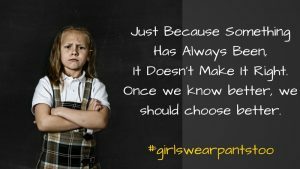 This has continued even since the school has agreed to the uniform change – ‘what kind of an example is she setting her daughter by letting her get her own way?’ is a fairly typical response. At my lecture on ‘Bringing Up Girls’ this week at St Mark’s Darling Point, during my visit to Sydney from the UK, I explored how we can support our daughters (and granddaughters, nieces, goddaughters and all other girls) by listening to them, understanding the pressures of their world, and helping them to navigate these pressures. One of the most important things we can do to help them is to show them how not to accept inequality, and as adults (and parents) we too need to call out inequality when we see it. We may have come a long way in a short space of our history to enable greater equality for girls and women, but there is a long, long way to go until we really can lay a claim to true equality – an equality which benefits everyone. The aggressive nature of the debate that has grown around the petition started by this mother does not stem from her words or actions. On the contrary – she is seeking a legitimate way to raise her voice: a process that we should value in our democratic and civilised society, having explored other ways to tackle the problem. She deserves – everyone deserves – a respectful hearing, followed by active and supportive engagement in how to create a solution. Moreover, this is an incredibly important issue, and she deserves further respect for having the courage to focus on it, and to speak out about it. It may be hard for us generally to accept that school uniforms have inequality embedded within them, because for years this was not on our radar, and we are heavily influenced by a history in which school uniforms represent so much more for us than just clothes – they stand for rigour, discipline, tradition. 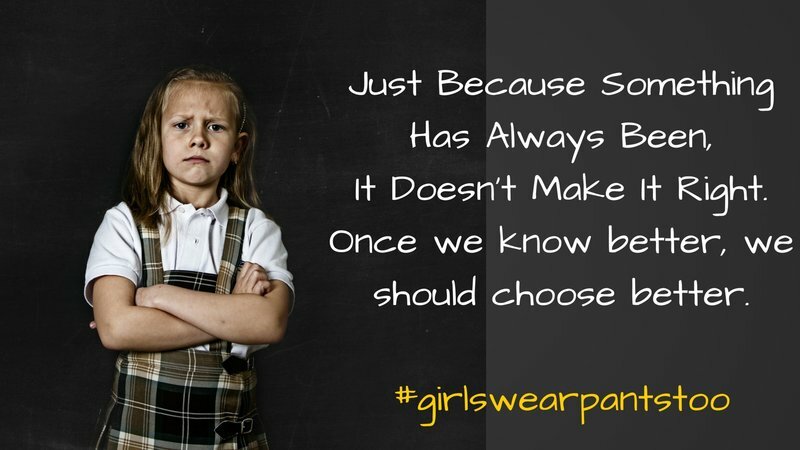 However, now that we have realised that they disadvantage girls, we need genuinely to look at our school uniforms, and – even better – to engage girls and parents in the debate about how to change them. Gender equality really, really matters – and nothing is served by either trivialising the issues or by aggressively attacking those who raise them. School uniforms need to be back on the agenda – and we need to iron out inequality, one uniform at a time. © 2019 Dr Helen Wright's Education Blog.